The route is packed with things worth seeing in Amsterdam. As such, you pass the world famous Rijks Museum on the Museumplein twice and you also run past the Museum of the Tropics and the Amstel Hotel. And along the way the enthusiastic residents of Amsterdam cheer you on. The Vondel Park is also part of the course. In the full marathon Amsterdam’s largest public park is first approached from the Amstelveenseweg. The second time you come from the opposite direction and enter the park from the Leidseplein side. The 48-hectare park, full of flowers, ponds, footpaths and playgrounds is a favourite among Amsterdammers. There will be a sponge and water station along the route, handing out water and sportsdrink (Isostar) as well as fruit to the marathon runners. Toilet and first-aid facilities will also be available. Each participant will receive a medal after the finish. After the event, you can turn this medal into something really special by personalising it and having your name and performance engraved on the back at the engraver’s stand between the Olympic Stadium and Sporthallen Zuid. If you have ordered in advance, there is a medal on your bib number. This will costs €8,-. You can check a bag or clothing for free at the Olympic Stadium (for the TCS Amsterdam marathon participants) and in the car park of the sports venue Sporthallen Zuid (for the mizuno half marathon and TCS 8K participants). Please leave bags and clothes at your own risk. Clothing cannot be taken into the stadium. Clothing that is left behind will be given to charity. Time limit of 7.5 hours to finish the race. The weather was just perfect to run my first half marathon. In some places they narrowed the roads and therefore it slowed down a lot as there where many people. The weather was just perfect to run my first half marathon. In some places they narrowed the roads and therefore it slowed down a lot as there where many people. In one word - Fantastic. The route was very good and flat. The finish in the Olympic stadium was amazing. It was perfectly organized - very good services and good refreshment stations. Great support f... In one word - Fantastic. The route was very good and flat. The finish in the Olympic stadium was amazing. It was perfectly organized - very good services and good refreshment stations. Great support from the cheerful crowds. Perfect weather. I have been there for half and I will go again for a full marathon. The only marathon where you can smell weed along the way (joke). Fantastic marathon, nice flat route with all sorts going on to watch and a great crowd cheering you on. The only marathon where you can smell weed along the way (joke). Fantastic marathon, nice flat route with all sorts going on to watch and a great crowd cheering you on. Pro: fast track, fantastic start and finish area (Olympic stadium), very well organized, good services, good refreshment stations, perfect weather (2018) Con: 8-10 kilometers are very narrow. Pro: fast track, fantastic start and finish area (Olympic stadium), very well organized, good services, good refreshment stations, perfect weather (2018) Con: 8-10 kilometers are very narrow. One of my favorites manathons so far. So unique to run this course - you will run under the Rijksmuseum and then around the city and peaceful contryside. I enjoyed finith at the olympic statiom very m... One of my favorites manathons so far. So unique to run this course - you will run under the Rijksmuseum and then around the city and peaceful contryside. I enjoyed finith at the olympic statiom very much! Organisation is great, but be aware thath there are n ochangings rooms, but is was not a problem for me - I got to the starting place in my running gear and just some warm clothes, which I discarded as soon as I started to run. The start and finish of the marathon take place in front of the grandstand in the Olympic Stadium. This splendidly renovated, over 85-year-old stadium will leave a memorable impression at the end of the race. Supporters and other spectators have free access to the grandstand and the bleachers. Amsterdam Marathon will lead marathon runners through the heart of the Rijksmuseum, the famous passage which connects Amsterdam city centre with the south of Amsterdam. This promises to be a unique experience for the many thousands of entrants from the Netherlands and other countries. The monumental building contains some of the most world famous works of art by celebrated Dutch masters such as Rembrandt, Van Gogh and Vermeer. The museum has recently reopened following a complete renovation. The largest public park in Amsterdam has an entrance at the side of the Leidseplein. The 48-hectare park is full of trees, ponds, paths and playing fields and is dearly loved by every resident of the city. On sunny days, thousands of Amsterdam residents enjoy the park. Everyone can be found there, from sport fanatics to the health conscience to music lovers, occupied in their different ways. The variety of activities makes wandering through the Vondelpark especially fascinating in the autumn. During the marathon the runners will cross the Vondelpark twice. The route of the marathon follows part of the Olympic route along the Amstel River, past stately mansions and several windmills. This rural part of the course has splendid panoramic views and gives an impression of the busy activity dominating the Amstel every day. In the distance the Arena is visible–the home stadium of the local Ajax football team. The meandering route along the Amstel is not only interesting for its range of scenery but also for—more importantly—the sight of other participants running on the other side. The start and finish take place in the historical Olympic Stadium. And every year this leaves an unforgettable impression, not least because of the presence of the supporters in the tribunes and the marathon grandstand. The Marathon course follows a part of the Olympic route along the Amstel River, past stately homes and a few windmills. 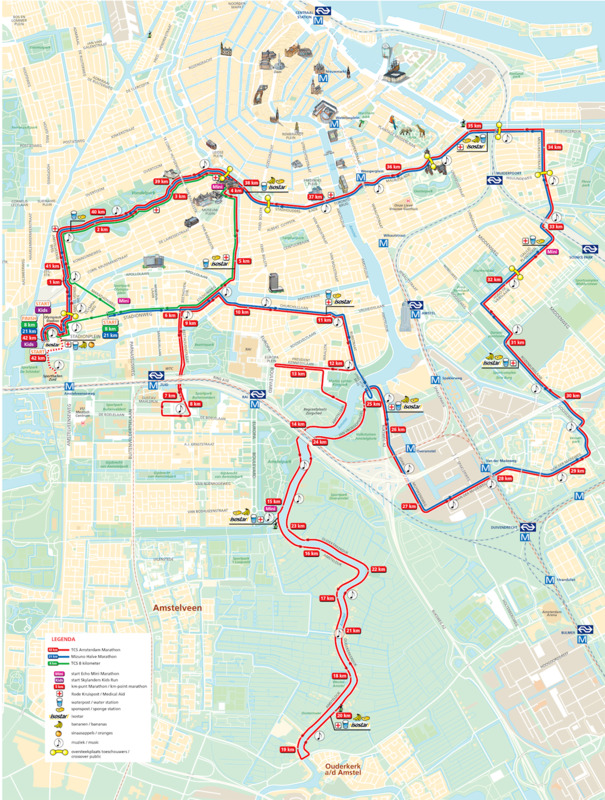 This route offers beautiful rural scenery (which includes the Arena) and gives an impression of the huge amount of daily business that takes place on the Amstel. In the 31st edition of this competition in 2006, the wind prevented fast running times among top runners, with an exceptionally exciting finish for the title among the men. Newcomer Solomon Bushendich (2.08.52) from Kenya defeated his fellow countryman Bernard Barmasai by just two seconds. Most noteworthy was the record number of participants, with over 22,057 runners from 63 different countries competing in the various distances.